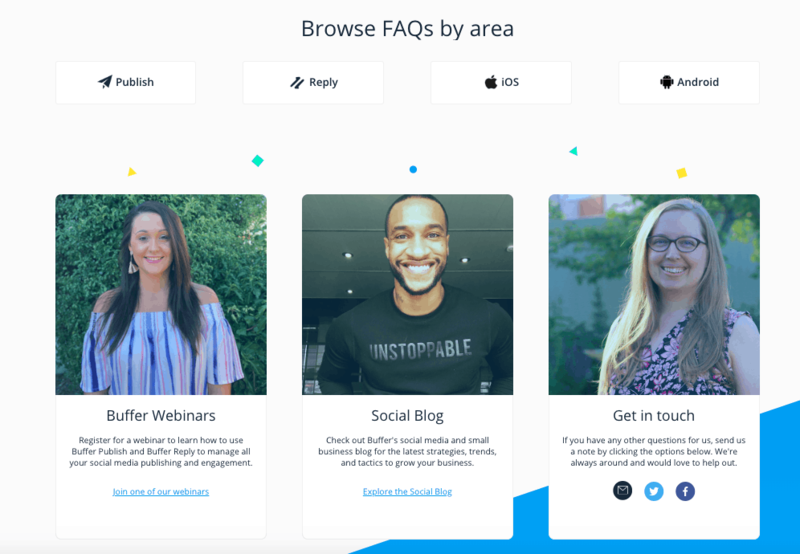 Buffer 2019 review - why 4.6 stars? The beauty of Buffer lies in its simplicity. Anyone can get started easily and be scheduling posts within minutes. The free plan might suit an individual, but to really get the benefit of Buffer, you’ll need to sign up to one of the paid plans, which can get quite pricey (given the level of features) for larger teams. Founded in 2010, Buffer has over 80,000 businesses using its services. It’s often classed as one of the heavyweights of the industry and seen as one of only a few viable options. But before you jump straight in, be aware that Buffer is not the right solution for everyone. If you’re looking for an all-in-one solution, you will better served reading my detailed review on Sendible. Buffer focuses on publishing and scheduling content. 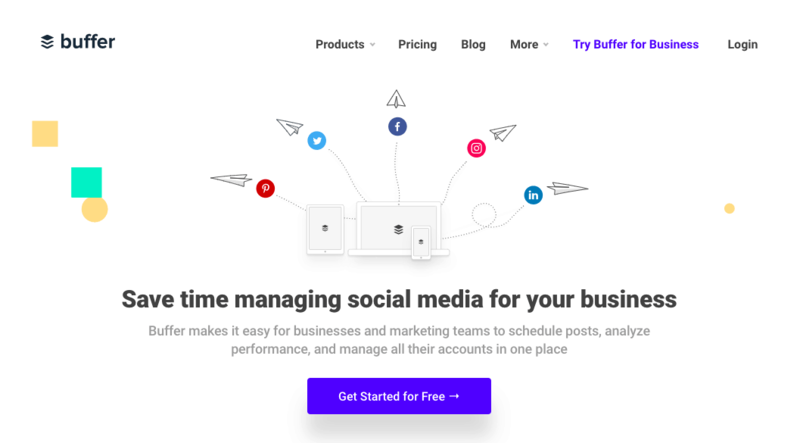 Unlike some services, Buffer only connects with some of your social media accounts, including your Facebook page, Facebook Group, Instagram, Twitter, Linkedin, and Pinterest. 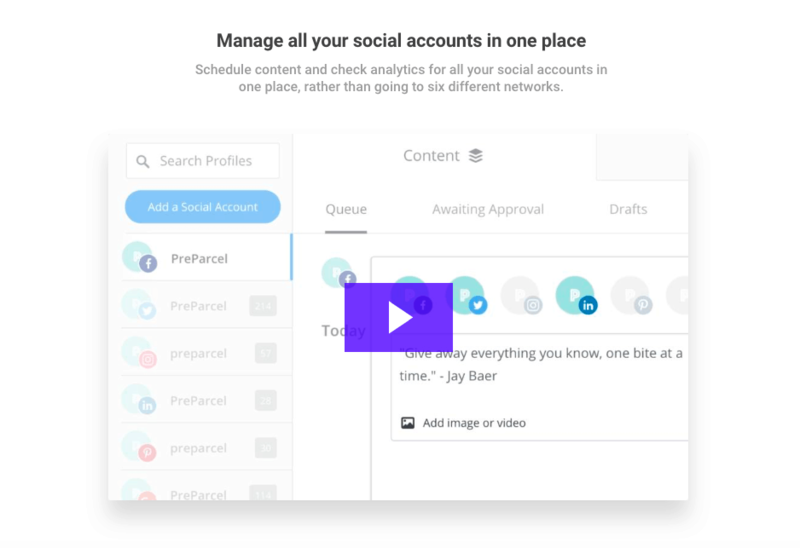 Depending on your plan, you can manage up to 150 social accounts and 26 users. There’s also a freemium plan which lets one user manage up to three social media accounts (albeit it with relatively limited resource quotas). 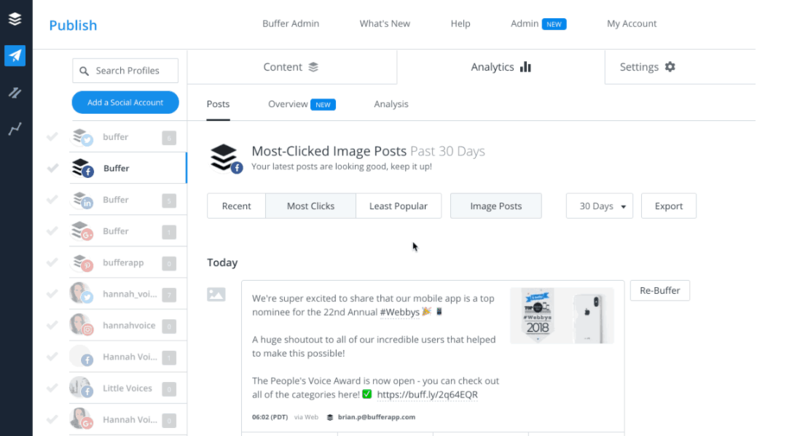 This article is going to dive into Buffer’s features, ease of use, support, analytics, and reporting. By the end, you’ll know everything about Buffer and more importantly, whether it’s a good fit for your business or agency. The KISS principle neatly sums up Buffer’s features. They are simple, yet effective. You won’t find an endless list of features here – instead, there is a small selection, but they are all high-quality. Granted, this means that you won’t find a solution for every problem (in fact, as you’ll find out, some pretty major ones are lacking). This is where Buffer really excels. 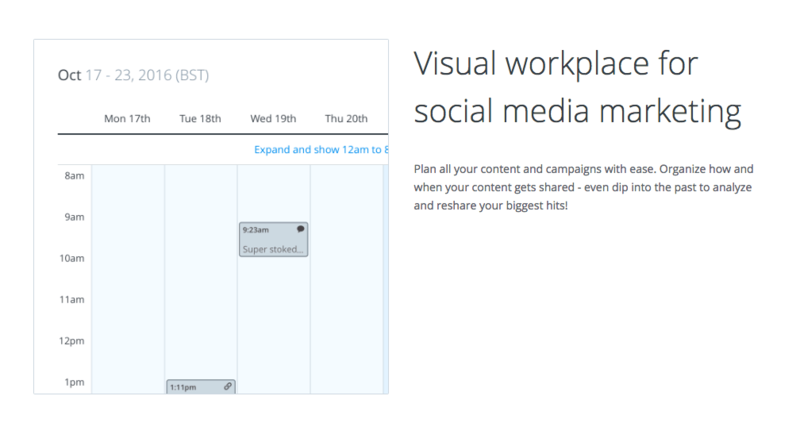 You can create posts for multiple social media accounts and schedule them, all in one go. You can also easily invite team members to collaborate or approve a post before it goes live. The browser extension is also useful for adding content to your queue while you’re browsing the web. The mobile app allows you to create and publish posts from your phone. While this feature is generally pretty solid, there are occasional bugs, and if you move a post from one day to another, it automatically moves a different post into the vacant slot. Also, the lower-tier plans come with restrictive scheduling allocations. It’s not a daily or weekly limit, but if you need to schedule more than 100 posts at any one time, you’re going to need to upgrade to one of the pricey higher tier plans. 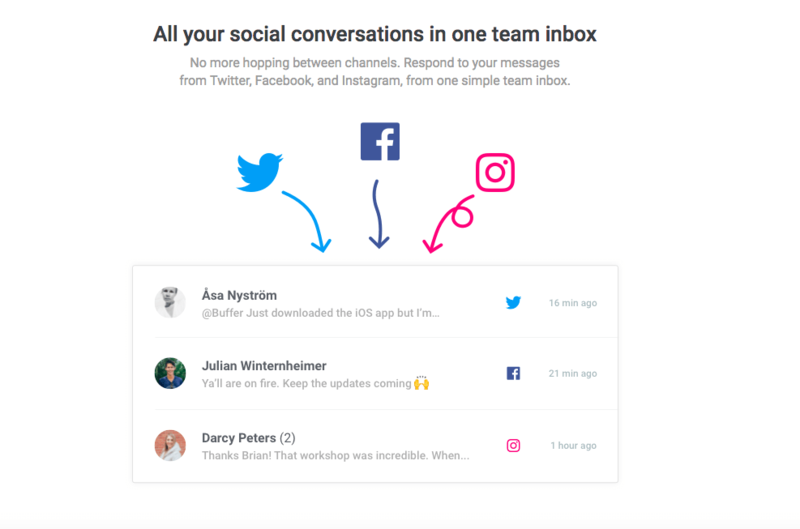 While Buffer’s simplicity lends itself to smaller teams with less complex social media management tasks, there is still a decent range of features to aid team collaboration. 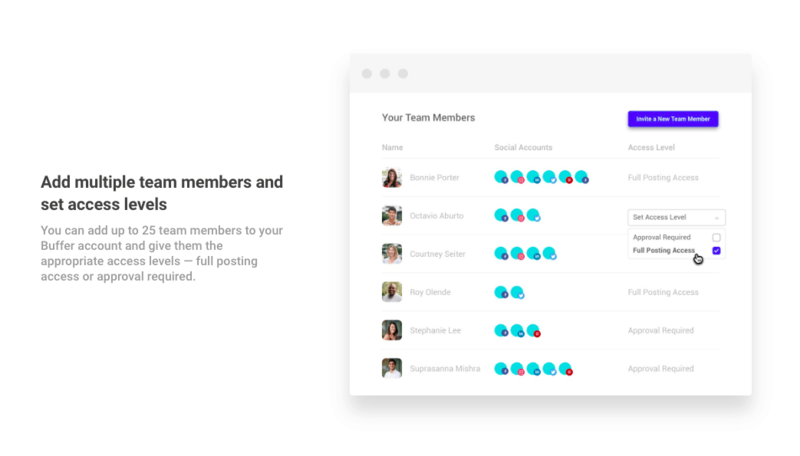 You can add team members and assign them to specific social media accounts, as well as assign them certain editorial levels (although there are only two options: full posting and approval only) and admin rights. Overall, Buffer has a nice interface, which is (generally) easy to use. This really shines in the calendar feature, which not only looks good, but is helpful for finding gaps in your upcoming content schedule. You might experience a few glitches when using the calendar (for example, if you delete or move on social post, it affects the rest of the calendar), but nothing too serious. 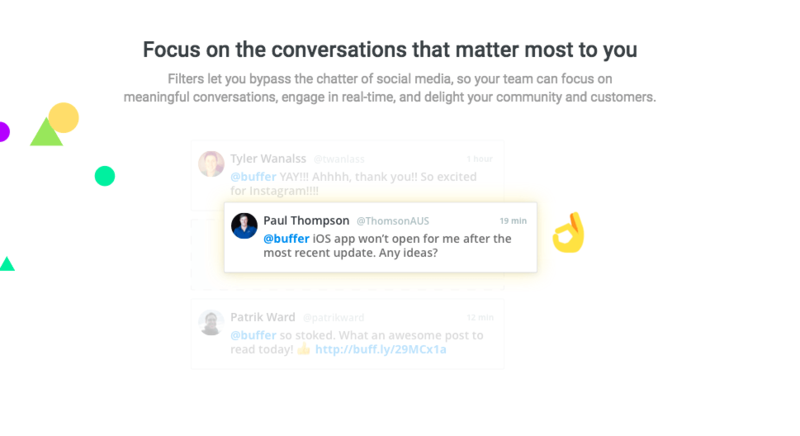 Buffer Reply is an inbox which collates all of your social media conversations. Like the rest of Buffer, the interface is sleek and easy to use. Kind of like a mini CRM, you can respond to messages, assign them as tasks to other team members, and add internal notes. You’ll get a background check on leads, so you can learn about the person you’re talking to before you reply. You’ll also get analytics to help you understand your team’s behavior and performance so you can, for example, see which team members are the quickest to respond. Buffer Reply is a standalone tool (with a separate price). Aside from the additional cost, one of its major drawbacks is that because you need to switch in between the two platforms. Also, the simplicity means a few features are lacking. The filtering options are quite limited (you can’t select to view only Facebook messages, for example) and the analytics are quite basic. As Buffer is primarily for post scheduling, the social listening feature is limited. The only taste of social listening you’ll get with Buffer is in the top tier (very expensive) plan of Buffer Reply. While it offers social monitoring, it’s for Twitter only, but you can set searches for keywords, phrases, or competitors. If social listening is one of your top priorities, you might want to check out my Hootsuite review. Alternatively, if you’re set on Buffer (and I can’t blame you, the interface is far sleeker than Hootsuite), you can use the Mention integration as a workaround. However, it’s not ideal to have to sign up and connect a third party tool (especially when most other companies have this option built in). One of the main issues with Buffer is Instagram automatic posts… or lack thereof. 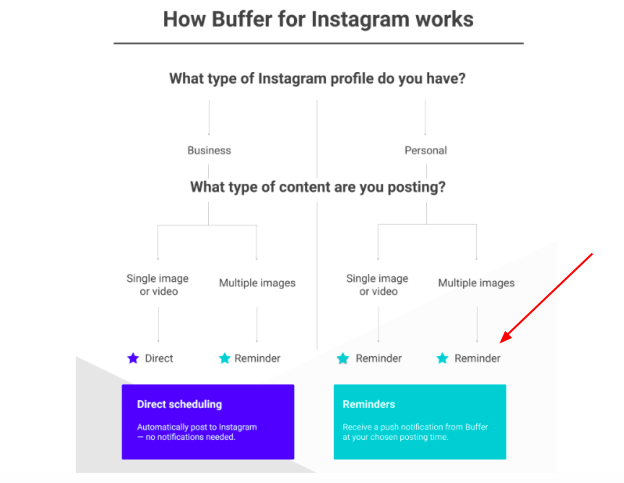 While Buffer has listened to its customers and introduced a new feature to allow direct posting to Instagram, it’s not without its limitations. For instance, you can use this feature to directly schedule single images or videos to Instagram, but if you need to do multiple images or you have a personal Instagram profile (not a business one), you can’t. 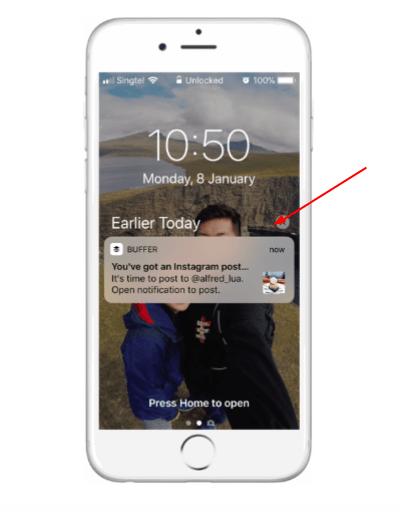 Instead, you can schedule to post and Buffer will send you a push notification to remind you. As this is a feature blocked by Instagram, it’s great to see Buffer providing a workaround. 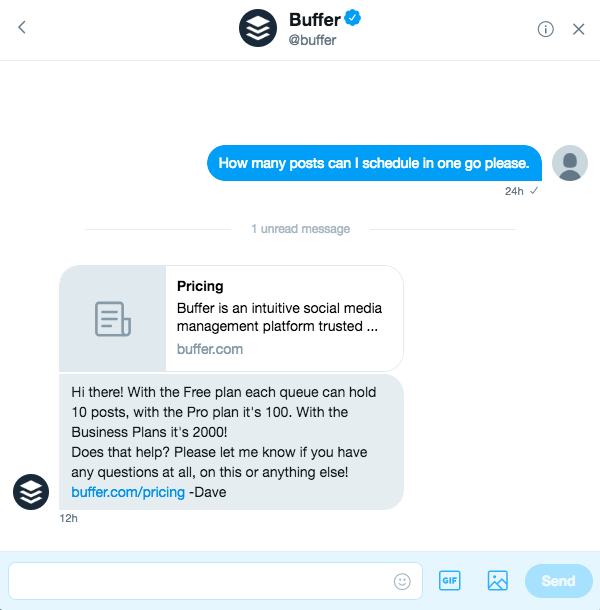 It’s easy to get set up with Buffer – it only takes a few minutes to create an account and connect your social media accounts. The layout is very intuitive and beginner-friendly. Overall, Buffer has a much smaller learning curve than other apps, but then again, there are fewer features to learn. Shortening your URLs is important for tracking and also for simplicity when it comes to posting – no one wants to see a huge, long link in your Facebook ad. Any link that you share to Buffer will automatically get shortened to buff.ly, bit.ly, j.mp, or a custom solution. Plus if you are using Buffer for Business, any link you share can have Google Analytics tracking codes automatically added, once you set this up with a few clicks in your settings. Unlike a lot of social media management apps, this one is really easy to use and has a nice interface. Buffer makes it easy to manually post from the app. For instance, the text and image are pulled into Instagram and all you need to do is paste in your text and hit share. You do need to have the app in order to get reminders on your phone, in case that’s an issue for you. Finally, not a huge problem, but the iOS app and extensions can be slow to load the data to share posts on occasion. 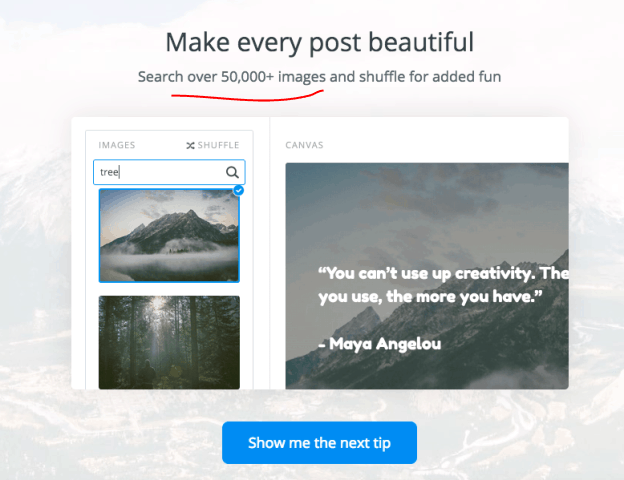 Pablo is Buffer’s own tool which allows you to quickly and easily add and edit images for your posts. Not only can you choose from more than 50,000 images and pick from 25 font formats, but you can also resize with a couple of clicks to meet the specifications for a social media network. Once you’re done, hit share or download. Like Buffer Reply, Pablo is a separate (free) tool, so you need to do a few extra steps to get images shared with Buffer itself. Also, it would be nice if you could monitor the results of Pablo images inside Buffer. When it comes to reports and analytics, is less really more? Buffer’s reporting features are quite basic, primarily providing data on engagement. If you want to dig further into demographic data or sentiments, you should consider reading my Sendible review. Buffer doesn’t advertise when it will be launched or specific details, but if you’re a die-hard Buffer fan, you can wait for the release of Buffer Analyze, which could solve your reporting issues. The analytics dashboard is easily accessible via the admin (if you are on one of the three Advanced plans). It’s easy to understand and navigate, even for beginners – however, this is by in large due to the fact that there is minimal data available. There’s only three or four (if you’re in the top plan) reports; Posts, Overview, Analysis, and Influencers, so it’s easy to click through and navigate between them. Reports are limited to Posts, Overview, and Analysis, which all give a basic overview of some of your social media data. Granted, reports can be customized and easily exported to CSV or as images, but overall, the offering is limited when compared to other vendors, who allow you to schedule automatic reports and download to PDF, for example. Like many Buffer customers, I am left underwhelmed by the reporting capabilities. But it seems like Buffer’s been listening and there’s a new Analytics tool on the horizon. It’s not clear what it will cost or what will be included, but you are able to sign up for early access or notifications on the product…so watch this space! The screenshot below clearly explains which data is pulled into the reports by social network, so if there’s a specific statistic you need, you can easily refer to this chart to make sure it’s included. Oddly, Facebook shares are not included, while reach is only available for Facebook pages (not groups). There’s also no mention of Facebook Ads, which isn’t included at all. It’s also important to note that only the Advanced plans include analytics. Depending on which plan you select, it could affect how your Twitter data is presented. If you’re interested in analytics (you should be! 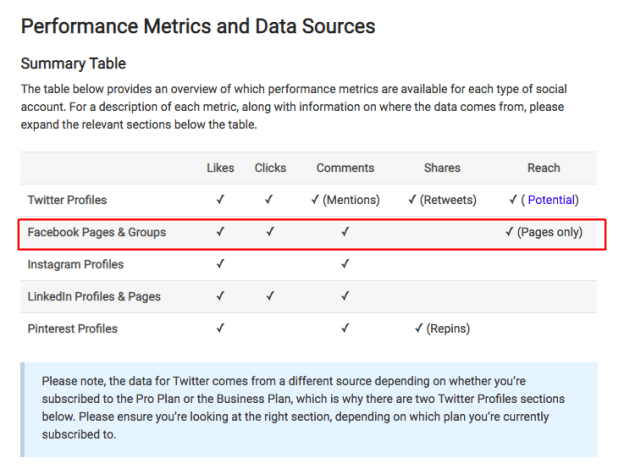 ), this article covers the ins and outs of Buffer analytics in more detail. 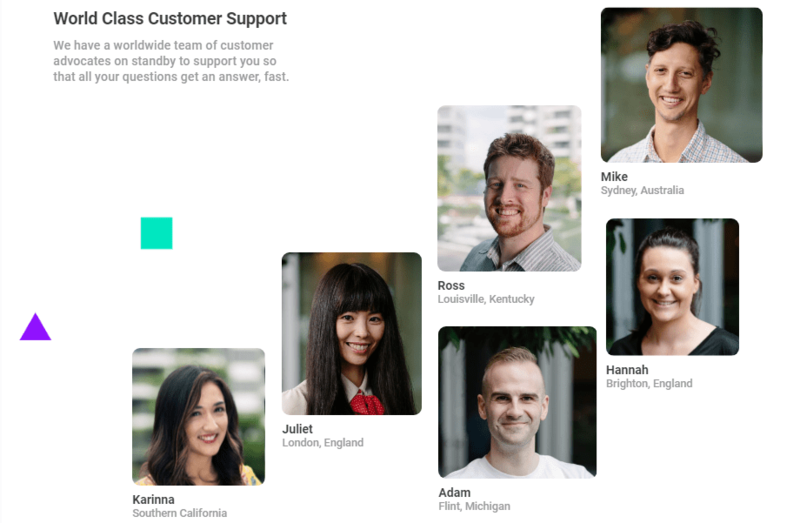 If you like to research issues on your own, the support section on Buffer’s website is quite comprehensive, but I don’t think it will replace the need to contact support. There are FAQs, which are split into topics such as Buffer Reply, Publish, etc., as well as tutorials and a handful or webinars. You can contact customer service by email, or if you are logged in, you can also contact the team via Facebook messages or Twitter. As the business hours are not advertised on the website, I contacted the team to ask them when customer service is available. I was advised that there are team members located all around the world and the average response time is less than six hours at any time of the day (although it was slightly higher due to less staff at the present time). I couldn’t help but notice that reply took almost 12 hours to arrive! 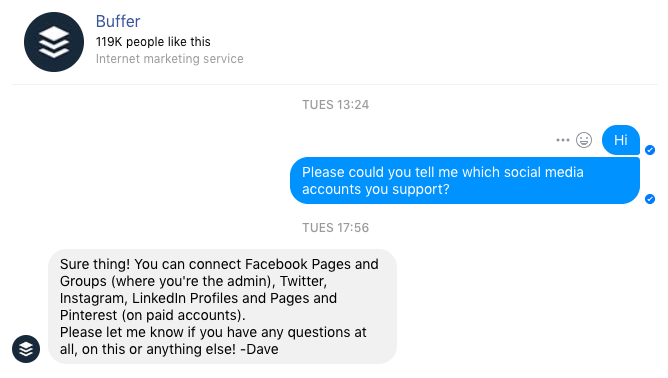 Buffer has a kind of live chat system which uses Facebook messenger, which is fine, as it’s a smooth transition from the website to Facebook. I asked the support agent which social media accounts are supported; I received an answer with 5 hours when I sent the message at 1:00 PM on a weekday. The agent was helpful and polite, answering all of my questions in full. There is also Twitter support, which again is used as a kind of live chat option. I asked the team how many posts I could schedule in one go via a Twitter DM. Again, it took 12 hours to get a reply, although it was polite and friendly. Finally, I sent an email and asked how I could view my online invoices. I sent the email at 6:00 AM UK time and this time the response was far quicker; less than three hours. The operator was polite, warm, and answered my question in full. I like the fact that there’s a freemium version. It certainly helps you get in and test out the tool. However, the features are restricted and it’s highly unlikely that you’ll get everything you need in the plan. For instance, even if you just need one user and three social accounts, if you’d like analytics, calendar view, or RSS feed, you do need to upgrade to one of the paid plans. The second cheapest plan includes a lot of the features (except Pinterest and Advanced Analytics), but it still only comes with one user. Therefore, unless you’re a solopreneur, I would say it’s safe to assume you need one of the pricier advanced plans. You can pay for the plans with any of the major credit cards, e.g. Visa, Mastercard, and Amex; there are no other options, not even PayPal. You can sign up for a one-month or one-year term, with a 15% discount on the latter. As well as the freemium plan, you can try any of the packages with a no-obligation 7- or 14-day free trial – you don’t even need to enter your credit card details. 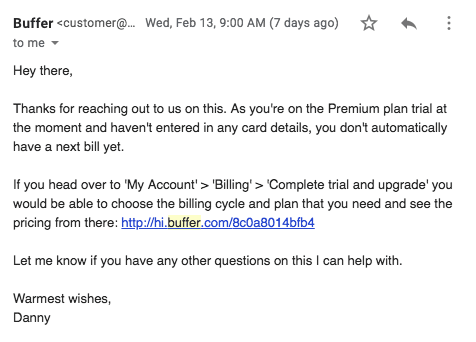 Not only was it really easy to sign up with Buffer – the cancellation process was smooth too. As I was requesting a refund, I needed to contact customer service on live chat to request it. WIthin 10 minutes of contacting the team, the payment had been reversed and was back on my credit card. If you need to cancel your account or request a refund, this article covers my experience in more detail. The beauty of Buffer lies in its simplicity. Anyone can get started easily and be scheduling posts within minutes. This definitely means it’s not as feature-packed as some of its competitors, which will be a deal breaker for companies which need a more sophisticated solution. The free plan might suit an individual, but to really get the benefit of Buffer, you’ll need to sign up to one of the paid plans, which can get quite pricey (given the level of features) for larger teams. Overall, if you value simplicity and want a robust scheduling tool only, this could be a great option. However, if you’re looking for more of an all-in-one solution, I’d recommend reading my Sendible review.